Helena leads Workshop Architecture’s urban design work, creative and cultural projects. She loves to collaborate with other disciplines and is always open to new challenges. She has of experience working with non-profits, private companies and public sector organizations in Canada, USA and the UK. She brings a fresh approach to all her work from the design of public spaces to feasibility studies for cultural buildings to community engagement and public art strategies. 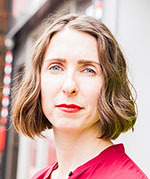 Helena is a member of the Metrolinx Design Review Panel, the City of Toronto’s Public Art Commission and the Active Neighbourhoods Canada Advisory. She has been a lecturer and guest critic at the University of Toronto Daniels School of Architecture, OCAD University, Sheridan College, York University, UBC School of Architecture and Landscape Architecture and Emily Carr University. Helena is the co-author of two books:Towards an Ethical Architect and The Contemporary Canadian Metropolis. She studied architecture at the University of Waterloo, where her Master’s thesis was recognized with the RAIC gold medal in 2001.